A tasteful collection of Italian delicacies including sun-dried tomato pesto, fresh basil pesto, olivada taupenade, gourmet dipping crackers, varietal farmhouse olives, aged balsamic vinegar, extra virgin olive oil, pennoni pugliese pasta accompanied with pomodoro rosso (red sauce). A great hosting gift for Italian food lovers. 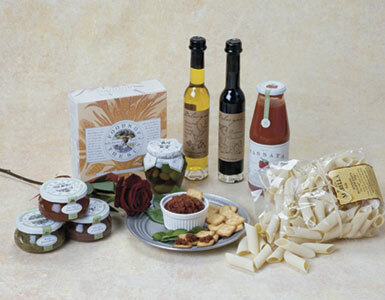 We specialize in Italian foods gift basket, Italian foods gifts, pasta baskets, and Italian gourmet gift basket. We guarantee prompt Italian gourmet basket and Italian foods gift delivery to your home or office in Beverly Hills, West Hollywood, Santa Monica and greater Los Angeles area.